I wasn’t sure what to expect when I was told that I would be facilitating poetry for seventh graders. It has been eight years since I’ve been a seventh grader, and I was quite certain that it has changed a bit. My first impression arrived sooner rather than later, when I perused the San Diego Global Vision Academy website. I discovered that their motto was: “Write the Future.” Prior to these sessions, I hadn’t had much practice teaching anyone in a classroom setting. I was a Resident Advisor for first-year college students, but that job didn’t include so much hands-on teaching as it did hands-on parenting, but enough about that. I was most excited when I realized that one of our sessions would fall on Halloween—it was both challenging and rewarding. Hopped up on sugar and the spooky spirit of the holiday, the students were focused and all over the place at the same time. This was our fourth session, and what happened during the hour really surprised me. Their attentiveness to the writing and overall focus on each task was unlike any other session before. It was a Friday, after school, on Halloween—the results floored me. We opened our session with an exercise focused on trick-or-treat poems. These were short four line poems, two lines of which were already given. I’m sure you know the two: “trick or treat, smell my feet/give me something good to eat.” While all of the students took to the idea with amazing ease, one student had called me over and told me something that caught me off-guard: “I don’t celebrate Halloween.” Other than the obvious questions that raced through my brain, I had to stay focused, like the students were with their writing. What do I do? What do I say? This wasn’t in the handbook! First and foremost, I remained calm. I asked clarifying questions: What are you doing tonight? Who with? That led me to my breakthrough with this particular student. They told me, “I’ll probably be watching Netflix with my family.” Of course! Netflix! That’s perfect! I asked if I could write the starting lines for them, and they happily obliged. The product of my help would be: “Netflix, Netflix on the screen/something funny should be seen.” I asked if they liked it and the response was a resounding ‘yes!’ I let the student complete the poem, and when I came around, the added lines were: “Boo the mom says and someone/pees, frightened if someone sees.” Sometimes all one needs is a little guidance to get started. 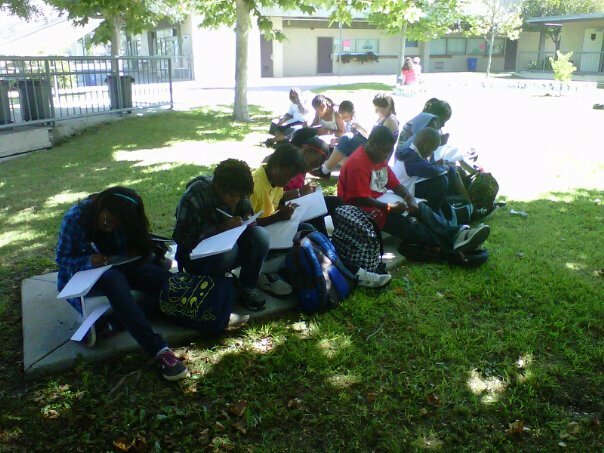 Something we try to do at all of our sessions is to physically sit down and help inspire the students to write. Sometimes that means we write a line for them, or ask them questions to get the thoughts flowing. The goal is to make sure that their pens pause over the paper as little as possible. It’s about constantly moving the pen, constantly producing and documenting, constantly writing their thoughts. Thus far, it’s been very effective. They each have something written every week. None of it is harshly criticized because the students are taking their first steps into the world of poetry. Who are we deny them entry or stunt their enjoyment because they misspelled a word? I still misspell words all the time, and I still write poetry. That’s the beauty of it; poetry is for everyone to find and grow their unique voice. What I hope to improve in the final sessions is the ability to work on the fly and adjust accordingly to unforeseen changes. You can plan a lesson, and maybe it looks fantastic, but what happens if you run out of time? What happens if they don’t respond well to the exercises? What if you plan a lesson for thirty kids and only five show up? There are many factors to consider when planning. Each session is its own adventure. It never hurts to be prepared for the worst, but that doesn’t mean you shouldn’t expect the best.